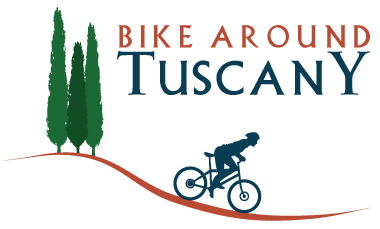 Tuscany Bike Tours | E-Bike or bust in Tuscany! E-Bike or bust in Tuscany! 29 Apr E-Bike or bust in Tuscany! Close your eyes and imagine a Tuscan landscape … what do you see? Cypress trees lined up along a hilltop crest, castles perched on hills, vineyards climbing up hillsides … hills, hills, and more hills. Tuscany is nowhere near flat, so to be able to take that romantic ride through the Tuscan countryside we have the perfect solution: rent an ebike or ‘magic’ bike as we like to call them. Two words: electric bikes. When we arrived at Luca and Bonnie’s bike shop, a few of us had heard of these “ebikes”, a few were hesitant, and a few wanted to use them. Luca encouraged us to choose the ebike option (as opposed to a regular mountain bike) not because he didn’t think we were capable or fit, but because he knew we would be able to enjoy the scenery and day 1000x more with a little “help”. The motor was small and didn’t get in the way and for those who didn’t want to use it, could be in the “off” setting. Let’s just say that the first time we hopped on our bikes and felt the extra push with the ebike in “tour” mode, we knew this was going to be fun. Then, when we met our first hill, we were thanking him profusely for recommending them. A couple in our group had been on a very challenging bike ride in Tuscany 10 years prior and were hesitant about doing it again. Thankfully, Luca and his ebikes allowed them to have a transformative experience and let them fall in love with the Tuscan hills instead of cursing them. We whizzed around for a couple of hours, zipping from one hilltop to the next, and feeling like we covered all of Tuscany. We explored back roads, hunting grounds, and wineries. After our incredibly fun bike ride, we made it to our wine tasting where we enjoyed numerous local wines and delicious Tuscan appetizers. A note on the ebikes: “tour” is the mode we were in most of the time, on major hills some of us found “turbo” mode and beat the rest of us to the top of the hills. With an ebike, even a hill feels like a flat! There is also an “off” setting so some in your group can get a good workout if they want. It was the highlight of the trip! We also loved spending time with Luca and Bonnie, learning about their lives.